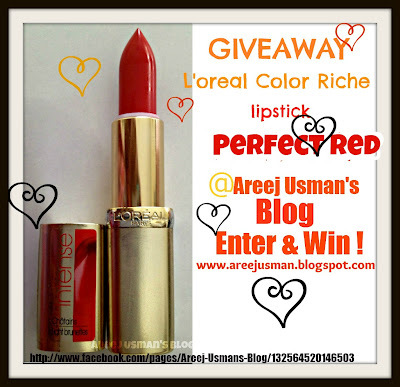 So You must all be thinking who is the winner of this lovely PERFECT RED Lipstick by L’oreal ! Well lets cause no further delay & lets get to the winner…..
CONGRATULATIONS !! & CELEBRATIONS !! Please reply to my email i am just sending you within 48 hrs to claim your prize! To all others keep an eye on coming giveaways! Thanks for the love n support. My Baby Started Solids !A special Order from Mady Bakes Cakes! Great blog areej <3 newest follower from Lahore!